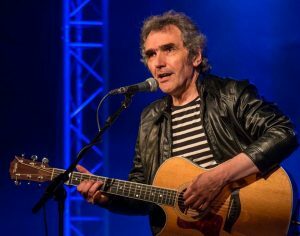 A double nomination in the 2015 BBC Folk Awards – for best singer and best new song – was a timely reminder of Jez Lowe’s standing in the UK folk and acoustic music scene. Not only he is one of the busiest live performers in the country, but his songs are among the most widely sung by other performers, whether by long-established acts like Fairport Convention, The Dubliners and Bob Fox, or by the new breed of stars like The Unthanks, The Young Uns and The Duhks. Jez’s own long-established band The Bad Pennies (featuring Kate Bramley, Andy May and David De La Haye) continue to attract a huge following, and his other collaborations with The Pitmen Poets (with Billy Mitchell, Bob Fox and Benny Graham), The Broonzies (alongside fellow-veterans Maggie Holland, Chris Parkinson and Roger Wilson), Men at Words (with James Keelaghan and Archie Fisher) and with fellow-songwriter Steve Tilston, show a willingness to push boundaries and venture boldly into pastures new. Meanwhile, his involvement in the award-winning BBC series The Radio Ballads continues, with his song The Wrong Bus singled out for inclusion on Radio 4’s Pick of the Year last December. The song is also featured on his last solo album, The Ballad Beyond, the success of which prompted a feature in fRoots magazine and glowing reviews the world over. Jez’s ongoing partnership with fellow-singer/songwriter Steve Tilston reached fruition in 2016, with the release of a duo album, The Janus Game, consisting entirely of new, co-written songs by the duo. They continue to tour together, most recently with the addition of Chris Parkinson on keyboards and Hugh Bradley on bass, under the monicker, The Tilston Lowe Sometimers. Jez’s latest project, earmarked for early 2018, is the publication of his first novel, The Dillen Doll, with an accompanying CD featuring a “suite” of traditional songs inspired by the story within it. This endeavour sees him return to his roots in the folk music of his native North East England, and will be the focus of his work in the year ahead, with live performances based around it earmarked for late 2018. Jez shows no sign of slowing down, with tours of America, Holland, and Canada lined up over the next twelve months, alongside an enviable list of UK dates. Festival appearances planned for summer 2018 include appearances at Warwick, Chester, Whitby, Broadstairs and Sidmouth. The Radio Ballads series continues to enthrall, and major concerts based around THe Ballad Of Child Migration are being lined up for the Autumn. So watch out, no doubt Jez Lowe is coming to a venue near you.